T1 apartments are proposed in the Residence (3 stars). These accommodations are equipped with a kitchen (sink, microwave, refrigerator, stove, hood, dishwasher and utensils), a living room with a bed (140 cm), and a bathroom with tub and toilet. 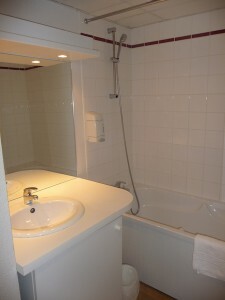 They are particularly suited to medium and long term stays (the price per night depends on stay’s length). 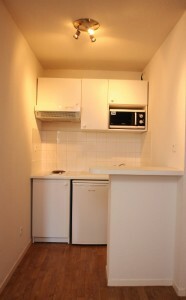 These apartments can accommodate up to 2 people. 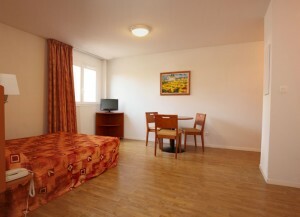 Equipment: LCD TV (French and foreign channels), air conditioning and phone in the room, WiFi (free) and parking (free).